Walmart has found its Eden. Today the retail giant publicly unveiled Eden, a high-tech “Intelligent Food” initiative designed to improve the quality of its perishable foods business and eliminate waste from its perishable food supply chain. What began as an internal friendly competition, or “hackathon,” among Walmart engineers to improve freshness has grown into a full-scale, company-wide program that was quietly rolled out to 43 grocery distribution centers and other facilities over the past year. In fiscal year 2018 alone, Walmart has eliminated tens of millions of dollars in spoilage and other costs on its way toward eliminating $2 billion in five years. 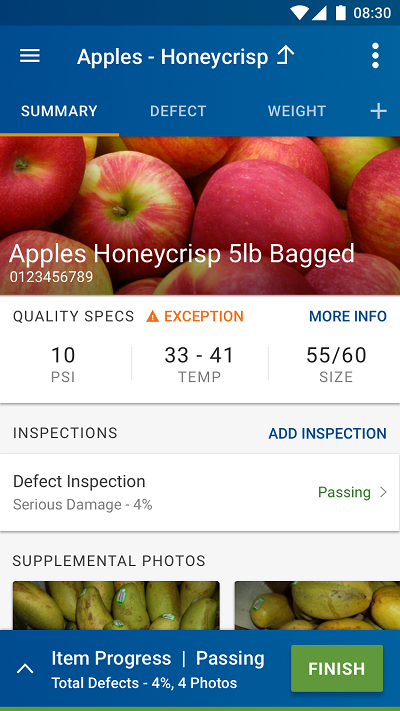 Visual inspection of fresh produce at Walmart’s distribution center is being automated and digitized with the Eden ecosystem. At left is a smartphone screenshot of Eden in action. With the results, Musani, along with Josh Bohling, senior designer of associate experience design, has filed two patents for Walmart. “Eden is now the cornerstone of Walmart’s move to improve the quality of fresh produce for sale to our customers,” wrote Musani. •Capture data and insights at every touchpoint in the supply chain. Armed with smartphone devices rather than clipboards and binders, Walmart associates in the distribution centers can speed through tasks that used to go slowly and less efficiently – for instance, users can take photos rather than writing things down. “With that database of a million photos – and growing – we can use machine learning to identify good or bad produce,” said Musani.